Home » Tips and Tricks » What is hydroplaning and how can I prevent it? Hydroplaning is when your vehicle’s tires are riding on top of a layer of water instead of the road. 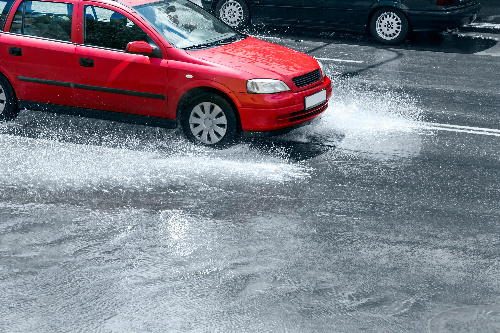 Hydroplaning causes loss of control that can lead to accidents and can happen anytime the roads are damp, even if there are no puddles forming. Learn more about what you should do if your vehicle starts hydroplaning and what you can do to prevent it from happening below. If you find yourself hydroplaning, don’t panic. Your vehicle is usually able to regain traction in a matter of seconds. To help your vehicle regain traction as quickly as possible, take your foot off of the accelerator and refrain from hitting the brakes. Instead, ride it out like you would if you were slipping on ice. If you find your vehicle veering in an unwanted direction, gently steer your wheel in the direction your vehicle is sliding to help straighten things out. Slow Down – The best way to prevent hydroplaning from occurring is to drive at appropriate speeds for the current weather. Hydroplaning can occur even when roads are simply damp, so in wet conditions drop your speed and take your time when braking or making turns. Take Care of Your Tires – The treads in your tires are there, in part, to help distribute water away from your tires so they can properly grip the roads. If your tire treads are bare or worn down, you are more likely to experience hydroplaning. Avoid Cruise Control – Because the first step in reacting to hydroplaning is taking your foot off of the accelerator, you want to avoid using cruise control when the roads are damp, so you have more control over the situation. Keep following the Coast to Coast Motors blog for additional automotive tips and tricks. Safe driving! This entry was posted on Wednesday, March 20th, 2019 at 1:59 pm	and is filed under Tips and Tricks. You can follow any responses to this entry through the RSS 2.0 feed. You can skip to the end and leave a response. Pinging is currently not allowed.